I'll just make this short blogpost about my wonderful experience in Eastern Samar. It happened 3 years ago. I will never ever forget it since it was my first time to take an airplane. I was a bit scared when it takes off but enjoying it when we were already up there, seeing the beautiful creations of God. We also experience turbulence in the air and safely landed on the province's airport. Our visit in my parents' hometown was really unexpected. The highlight of this vacation was... when the 3 of us (Mama, Big Sister and I) visits one of the beach resorts in Eastern Samar. We swam to infinity pool, had island hopping, visited a small cave, and stayed at a unique luxury room which again we didn't expect that we will be staying for an overnight. I don't want to make this long but overall we really enjoyed our vacation. Above is the photo of our luxury room. 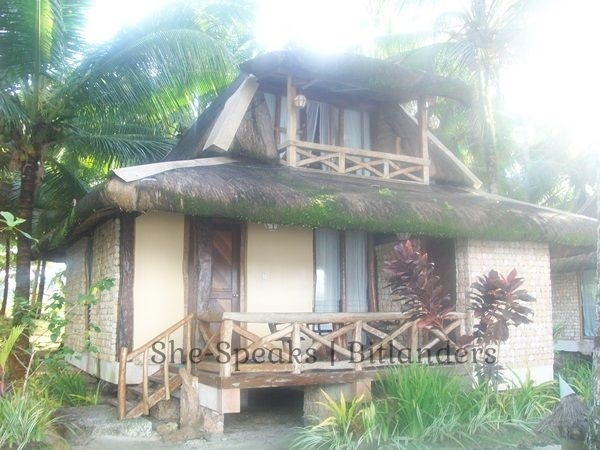 It has a loft with small veranda and can accommodate 5 persons. Unfortunately, that beach resort has already been swept away during the typhoon Yolanda. A petite blogger since 2002 who enjoys herself in web designing, traveling, cooking and making her own recipes. She spent most of her time infront of her laptop. She currently has 7 cats.